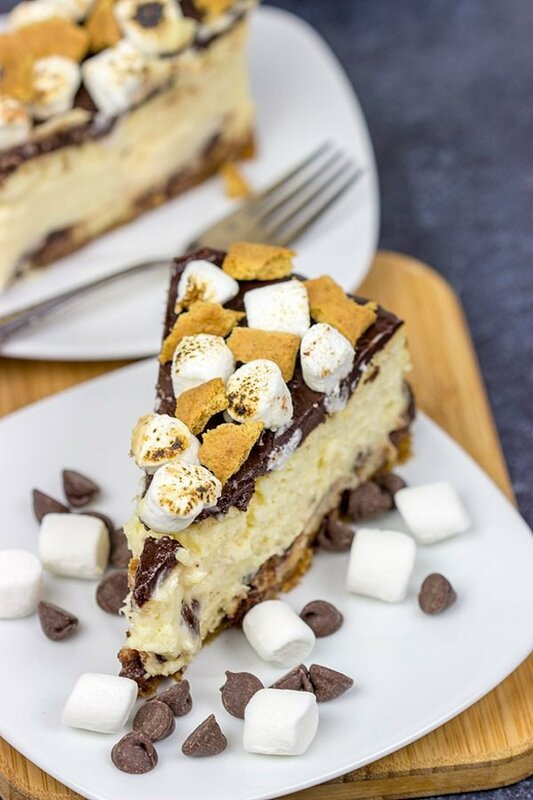 It might be chilly outside, but this S’mores Cheesecake is loaded with chocolate, marshmallow and graham crackers…and it’s sure to remind you of a summer campfire! As a kid, I used to love going on road trips. For the most part, road trips always meant going somewhere fun. Sure, I had to share the backseat with my sister, but we had an imaginary line back there that she wasn’t allowed to cross. (Although, I will point out that she used to love poking her finger over the line just to make me mad.) Robbie might look exactly like me, but the one place where we differ is roadtrips. The little guy hates riding in the car. And by hates, I mean hates. I’m hoping he snaps out of that as he gets older, but we shall see. For me, roadtrips always meant fun. Roadtrips meant going on vacation or perhaps going up to visit my grandparents in upstate South Carolina. Roadtrips also meant fun games in the car. I’m not talking about “I Spy” or the License Plate Game. I’m talking logic games. Yes, those books full of logic puzzles where you have to sort out who did what. I used to love those puzzles! And you know what’s funny? When I first moved to Atlanta, I taught LSAT prep courses as a way to make a bit of extra spending money. And there was a whole section of that LSAT prep course dedicated to logic puzzles. It totally reminded me of the hours I would spend working on those books somewhere on I-26W between Charleston, SC and Belton, SC…all the while watching to make sure my sister didn’t encroach into my half of the backseat. Speaking of my sister and logic, we need to talk about cheesecake. As a kid, I hated cheesecake. I think this was partly because I thought it was cake with cheese in it. 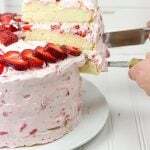 I like cake. I like cheese. But the thought of cheese in a cake didn’t appeal to me. That’s childhood logic at its best right there! Similarly, my sister loved cheesecake. And since my sister had cooties, I decided that cheesecake must also have cooties. Another excellent example of childhood logic at its finest! While I spent my formative years actively avoiding cheesecake, I’ve more than made up for that mistake as an adult. Take this S’mores Cheesecake for example. 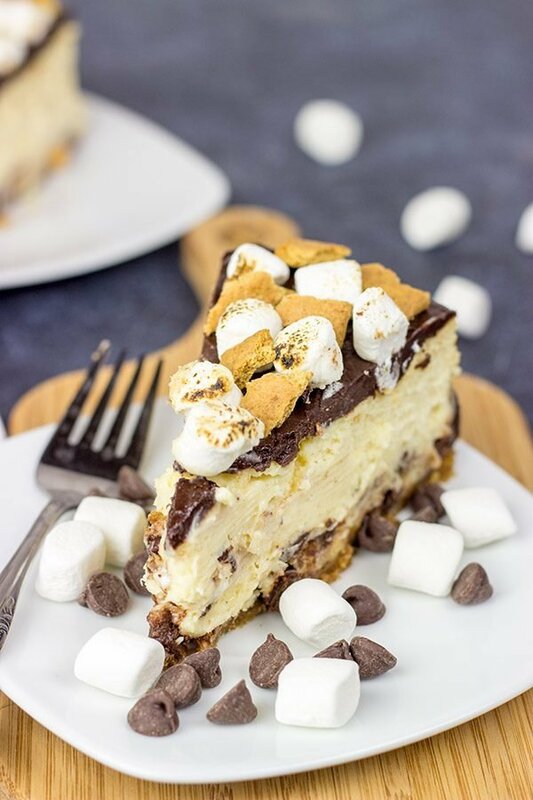 I would happily eat a slice of S’mores Cheesecake for dessert every.single.night. Of course, I’d have to start working out 7 days a week to justify that one, so maybe I’ll just save slices of S’mores Cheesecake for the weekends instead. Seriously, though, this cheesecake is delicious! Given that it’s quite chilly outside, I won’t be venturing out to make any s’mores over a bonfire in the backyard. But that doesn’t mean I can’t have that delicious combination of marshmallow, chocolate and graham crackers inside…in cheesecake form! 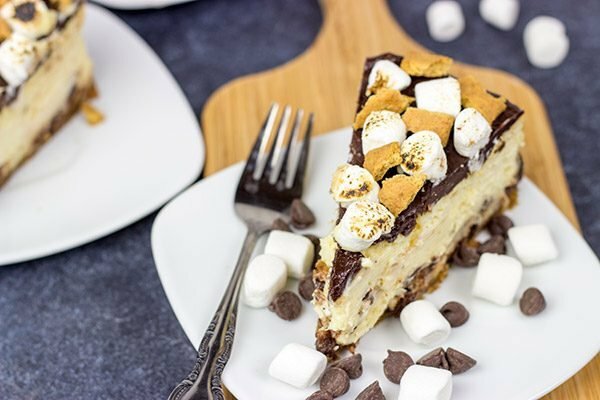 To boost the marshmallow flavor of this S’mores Cheesecake, I sprinkled mini-marshmallows all over the crust before pouring in the cheesecake batter. Oh, and I also used a cup of marshmallow fluff in the batter itself. On a side note, scooping out a cup of marshmallow fluff is quite possibly one of the messiest kitchen tasks ever! I think I ended up with a bit of fluff in my hair. Don’t ask how that happened. I hope everyone had a great Thanksgiving, and I hope you’re spending this weekend with family and friends. Oh, and I hope you’re also spending this weekend curled up on the couch with a slice of S’mores Cheesecake…I know I am. Cheers, friends! 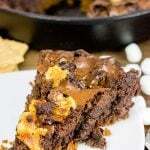 Looking for more tasty s’mores treats? 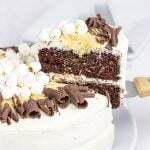 Check out this S’mores Cake and this Cast Iron Skillet S’more! Using a food processor or mini-chopper, pulse the graham crackers until finely ground. In a medium bowl, combine the graham cracker crumbs, brown sugar, and melted butter. Stir until fully combined. 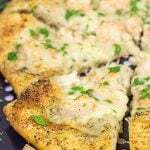 Bake crust at 350°F for 5 minutes. Remove from oven and let cool. Using a countertop mixer, beat the cream cheese and marshmallow fluff on medium speed until completely smooth (about 3 minutes). Whisk the eggs and egg yolks together and add to the bowl in 3 additions, mixing fully after each addition. Sprinkle chocolate chips and marshmallows evenly over the crust and then pour cheesecake filling on top. Remove cheesecake from oven and let cool at room temperature for 30 minutes. Using a small saucepan, add chocolate chips and whipping cream. Place over medium-low heat and cook, stirring occasionally, until chocolate chips are fully melted. Spread melted chocolate over top of cheesecake. Refrigerate cheesecake for at least 2 hours before serving. Crumble additional graham crackers on top of cheesecake immediately before serving. David, I think we might be secretly related. Those logic puzzles were my FAVORITE growing up. I loved them even more than I loved crossword puzzles, which is saying something, and my mom couldn’t buy puzzle books fast enough for me. I studied for the LSAT too. . .I was excited when I opened my study guide and saw logic puzzles similar to those I’d loved growing up. 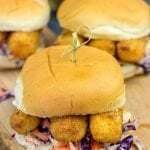 But they were SO much harder I just couldn’t enjoy them and quickly turned the the GRE :). Now let’s talk about this cheesecake. . .I’ll take a huge slice of this over leftover pumpkin pie any day. Have a great weekend! So I think we are definitely long-lost cousins, Kelsie. There’s just no doubt about it! I haven’t done logic puzzles in years now, but every time I fly somewhere, I’m tempted to buy a book to do in the plane. One day…one day. 🙂 This cheesecake turned out quite well, and we totally polished off a couple of leftover slices this past weekend. (It was pecan pie on Thanksgiving, but then we raided the freezer for the weekend…and this s’mores cheesecake was right on top!) I hope you had a great Thanksgiving weekend, my friend…err, my second-cousin-thrive-removed. Haha! Ah, in a very rose tinted glasses Way I loved road trips as a kid. We even had those logic games. I’m reliably informed by my mother that actually she dreaded them, especially the fights over whose side of the car people were on. This cheesecake would have gone a long way to improving that I’m sure! Oh my gosh, my sister and I used to fight over the silliest things! I mean can you imagine the whole “imaginary line” down the backseat of the car thing? I actually remember negotiating with my sister to let her have more of the seat if she’d let me stretch out across the floorboard. Man, those were the days, right? Haha! Thanks so much, Matt!! This is absolutely summer around the camp fire! It looks so amazing! By the way, I love those logic puzzles. When I was a classroom teacher, I used logic puzzles with my students often. They were a “bonus” way to fill extra time! I had no idea I was also prepping my elementary student for the SAT! Whoot Whoot! Yeah, those logic puzzles really are fun! I was surprised when I found out that they use used on the LSAT, too. (Surprised in a good way!) Of course, the LSAT versions are a good bit more difficult, but the same concept still applies. So fun! I might just have to pick up a book of logic puzzles to do during the holidays this year. 🙂 And doing those puzzles with a slice of smores cheesecake sitting by your side is the way to go! Thanks, Kathy! I hope you had a wonderful Thanksgiving weekend. I have played a lot of logic games with my siblings on road trips too!! I guess, it’s everyone’s childhood tradition! 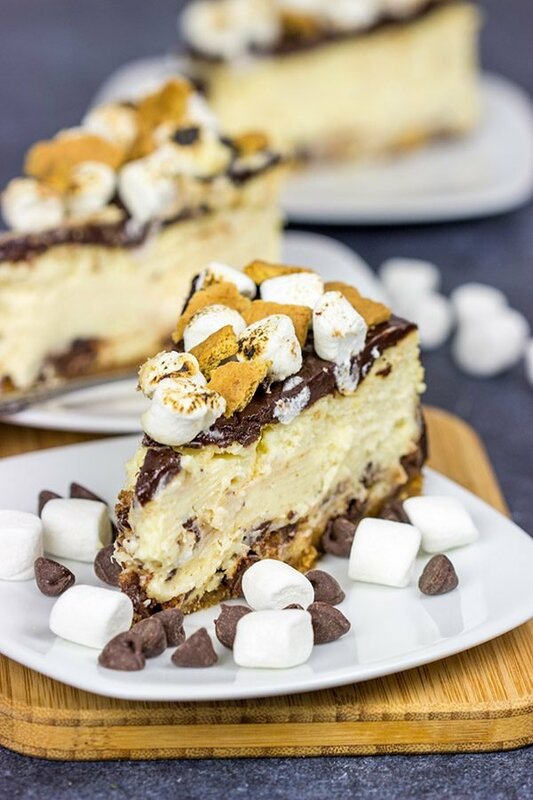 And this Smores cheesecake is the best dessert ever..I bet adding that marshmallow fluff to that cream cheese batter made it even more luscious and creamy!! I agree, Deepika! There’s something so fun about solving one of those logic puzzles. I haven’t done one in years, though, and I’m thinking I should pick up a logic puzzle book to play with during the holidays this year. 🙂 And I’m betting that a slice of this Smores Cheesecake would be an excellent way to help me solve that logic puzzle. (That’s good logic, right?? Haha!) Thanks so much for the comment, my friend! Glad you’ve come around on cheesecake, David! 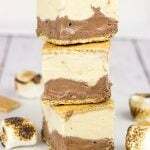 😉 This one looks decadent delicious and a fun way to enjoy the campfire treat year-round! Oh, I’ve definitely come around on the cheese, Marissa…not only that, but I’m working overtime to make up for those lost years! 🙂 This smores cheesecake is definitely one of our favorites, and we just polished off the last 2 slices this past weekend. Guess it’s time to bake another cheesecake, huh? Hope you had a great weekend, my friend! Wow! My family are S’mores fanatics, and also Cheesecake fanatics. No logic puzzle necessary for that – we would gobble this up in a day, or less. The real question is – “How dangerous would it be for Laura to make this cake?” But also, how delicious! On another note, I totally relate to your love of logic puzzles, they are my all-time favorite! Sudoku, anyone? Pinning this for later! Haha! This cake is mighty dangerous, Laura! I dare say that it even has magical properties because ours disappeared with no traces left behind. 🙂 And you know what’s funny? As much as I love logic puzzles, I’ve never been able to get into Sudoku. Perhaps if I had a slice of this cheesecake to keep me company though… 🙂 Thanks so much, my friend! I love road trips too. As a kid, we didn’t go on a lot of road trips, but now as an adult, I get to go on more of them. Wow, I love this cheesecake. It sounds wonderful. Road trips really are a lot of fun! You stumble across the most amazing sites and views. 🙂 Thank you so much, Dawn! I hope you and your family had a wonderful Thanksgiving! David!!! You are killing me with the desserts! There were those Nutella truffles that had me licking the screen and now THIS!!! Wow! I’ve gotta admit, I’ve never made a real cheesecake before – tons of cheese-cake-like cakes but not a real one – and Lil Shashi has been bugging me to try one this winter break between Christmas and New Year (her reasoning is we won’t have to share any then – that child is too much like her momma) – and am putting this on the list! 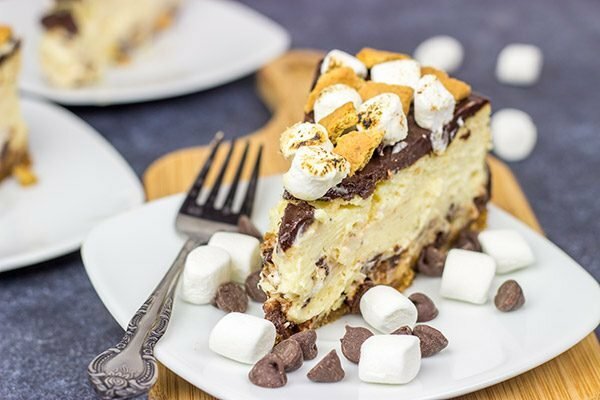 I mean – S’mores – in cheesecake form! Gosh, I better cut the recipe in half and use a smaller pan or we’d finish this in one sitting and be in the gym the rest of the time! Btw – I had a good chuckle reading over your sister’s and your backseat car antics and childhood logic – that line about your sister + cooties and your disdain for cheesecake – haha – too too funny – thanks for the laugh, my Upstate NYC friend! Oh my gosh, I can’t believe you’ve never made a real cheesecake before, Shashi! They are sooo good. 🙂 And like most desserts, cheesecakes are delicious by themselves…but they’re also a blank canvas for all sorts of fun twists. I love how this Smores version turned out. 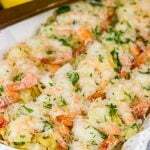 So fun, and so reminiscent of those favorite summer flavors! Also, I’m pretty sure my sister still has cooties. Haha! I was hoping you’d say that you invented this dessert when your wife asked for “some more” cheesecake.